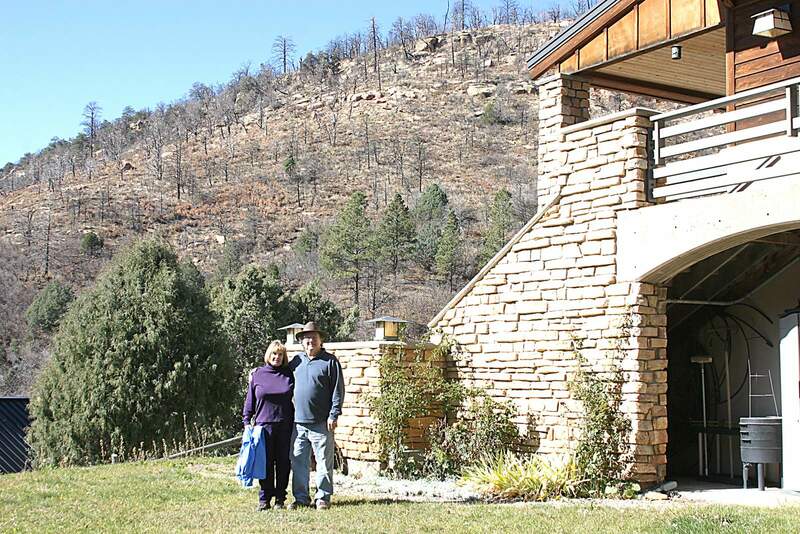 Philip and Linda Walters live in the Elk Springs neighborhood, which was threatened by the Weber Fire. Thanks to defensible space and thinning around their home, the fire did not reach their home. FireWise of Southwest Colorado has announced a fundraising effort to fill a gap in its budget after losing county funding. The loss in funding comes amid a dry season in which the snowpack in Southwest Colorado is 55 percent of its average. “If the current drought situation doesn’t quickly turn around, I’m afraid of what this wildfire season will look like locally,” Steve Underwood, retired fire management officer for Mesa Verde National Park, said in a news release from Firewise. Montezuma County commissioners recently eliminated financial support for FireWise of Southwest Colorado and its Neighborhood Ambassador Program, which provides education and technical support to help residents prepare for wildfire. FireWise is hosting Living with Wildfire, a resource fair and fundraiser to help fill the gap, the news release said. The event will include educational booths, demonstrations, dance bands, and live and silent auctions. “It will be an occasion to raise awareness, have fun and move forward,” said Amanda Brenner-Cannon, coordinator of FireWise’s Montezuma Chapter. The event will be held at the Mancos Brewing Co. on April 28 from 1–9 p.m. The cover charge is $10 at the door; $8 pre-registration; and free for those 16 and under. Special guests include Smokey Bear and dance bands Little Brother at 1–3 p.m., Carute Roma at 3–5:30 p.m. and the Afrobeatniks at 6–9 p.m. The live auction will start at 5:30 p.m. with auctioneer Larry Don Suckla. Food and beverages will be provided by the Mancos Brewery and the Blue Pepper food truck. To buy tickets and find event details, see FireWise of Southwest Colorado’s website at: www.southwestcoloradofires.org or find FireWise of Southwest Colorado on Facebook.